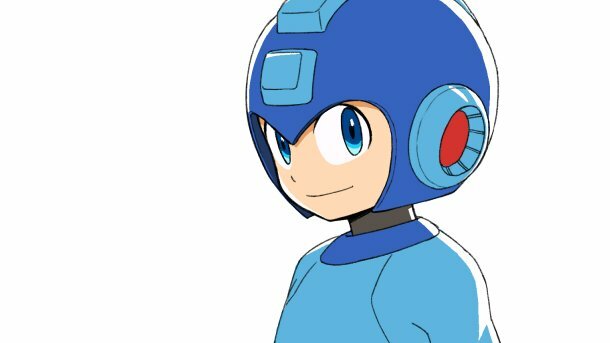 Udon Entertainment's Mega Man Mastermix is slated to hit shelves in late January, 2018. To celebrate the end of the year and the start of the next, I'm holding a contest to win all six issue #1 covers (these five covers + the very limited "Fried Pie" variant). To enter simply shoot an email to rockmancornercontests@gmail.com with the subject "MASTERMIX". One winner will be randomly selected at 12:00pm CT on January 31st, 2018. Entry is open to everyone – shipping is all on me. So wherever you are in the world, you're more than welcome to participate. That's all that needs to be said I think. My inbox is open and ready – good luck! Bandai have released a teaser trailer for the upcoming Super Robot Wars XΩ x Rockman collaboration event. Though the event itself doesn't begin until January 1st, 2018, players can start gathering special "Rockman tickets" right now. These tickets can be redeemed for SSR versions of Rockman units (Rockman, Blues and Forte and various Robot Masters) when the event launches. 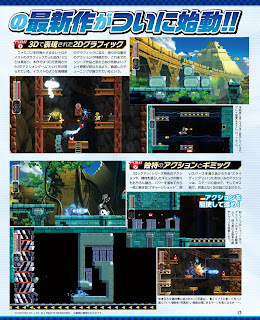 Oh, and this is interesting too: Rockman, Blues and Forte will be portrayed by veteran Rockman voice actors. 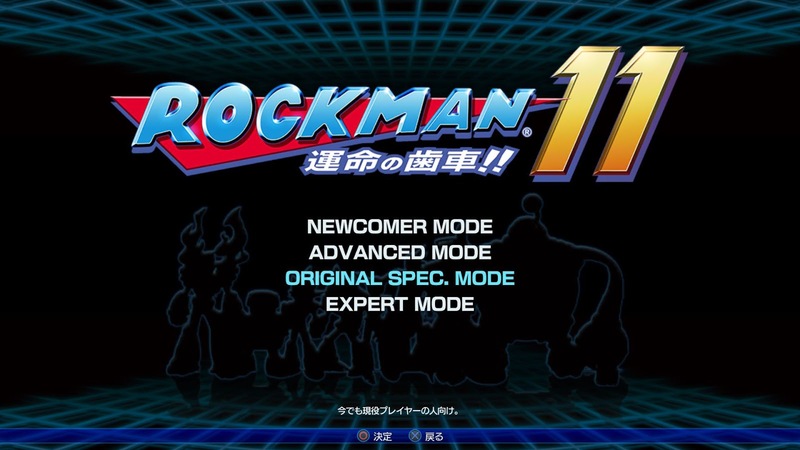 Rockman will be played by Ai Orikasaka (who hasn't voiced Rockman since Rockman 8 in 1997), Blues will be voiced by Ryutaro Okiayu (he played Blues in Battle & Chase; Zero in X4) and Forte will be voiced by Nobuyuki Hiyama (he voiced Forte in Rockman 8). 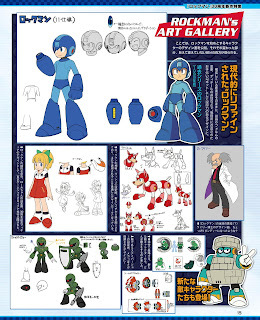 Is this casting a clue into who will be playing who in Rockman 11? Who knows! It's something to think about. 2018 is a big year for our blue boy. 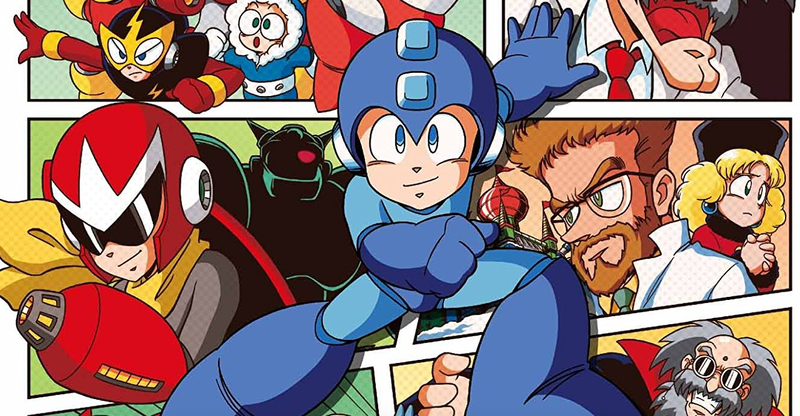 From Mega Man 11 to a new animated series, there's a little something for everyone. Here's a recap of what's coming down the pike. 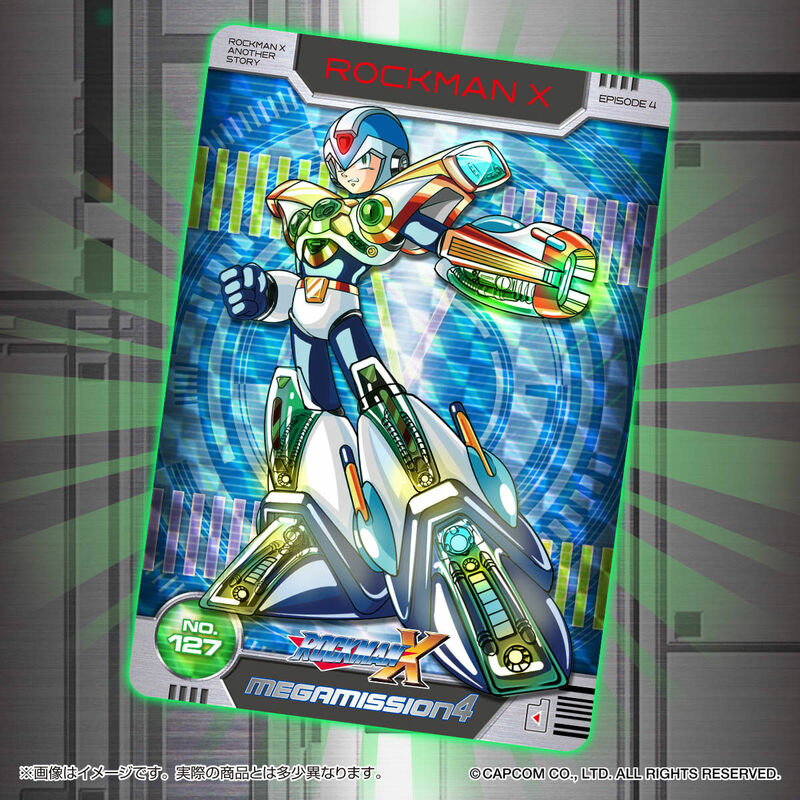 To commemorate Mega Man's 30th anniversary, UltimateMaverickX rolled out his very first fan-game: Rockman Xover Reborn. Inspired by the now-defunct mobile game, Rockman Xover Reborn should feel familiar to those who played the classic or X series games. 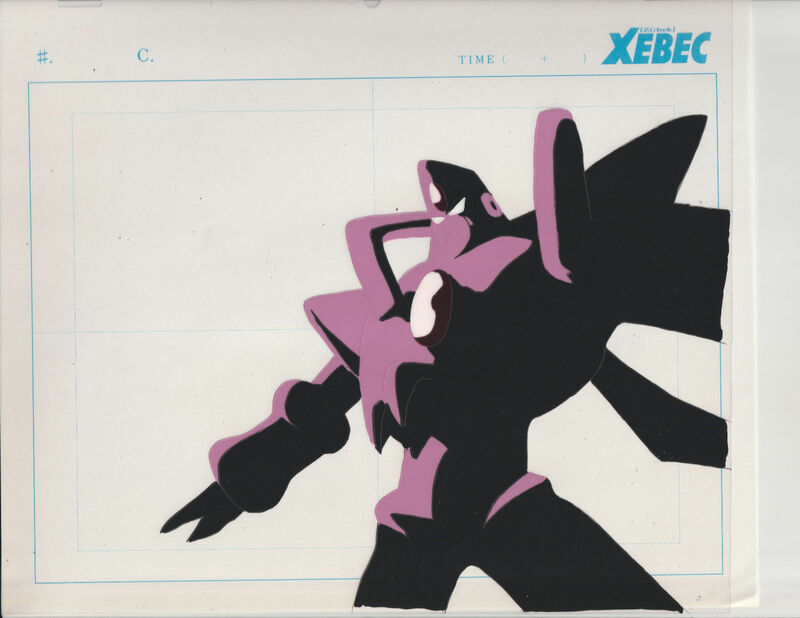 In other words, it's nothing like the real Xover. There are a couple hiccups and glitches, which are expected at this stage. The controls are different, to say the least. The setup is unusual but not impossible to master. You can play the game in your browser here. Beat it once to unlock a fun little surprise! In his free time, UltimateMaverickX is hoping to add more content to the game – additional stages, bosses and armors. We'll be keeping an ear out for sure! In the meantime, head to UltimateMaverickX's DeviantArt for more details. Heidi will be auctioning off more cels every so often, so don't fret if you miss out. What's more, she informs me there could be opportunities to win a cel or two from upcoming charity events. We'll have more news on that front soon. For now, happy bidding! If I wasn't a teacher, I'd be a Foley artist. So I'm pretty jealous about today's Game Informer Mega Man 11 feature, which introduces us to the game's audio director/Foley artist Ryo Yoshii. Yoshii is creating audio for the game using real-world sounds; a first for the Mega Man franchise. Four short (but very entertaining) videos at Game Informer show off this process. In the first video, for example, Yoshii uses a real hard-hat to design the sound for the Mets. Once the desired raw audio is found, Yoshii dumps it in a synthesizer to create a futuristic sound. Hop over to Game Informer for more! 20-years-ago today, the first 3D Mega Man debuted on the Sony PlayStation – Mega Man Legends. It's a series that's near and dear to the hearts of many (myself included). And sure enough, to mark the occasion, these passionate fans are putting together something pretty special. Heads up: It's December 17th in North America and that means Mega Man is officially 30-years-old. And sure enough, this is the first anniversary in many years that actually feels like a celebration. No longer do we sit, ponder and long for better days – they are here. 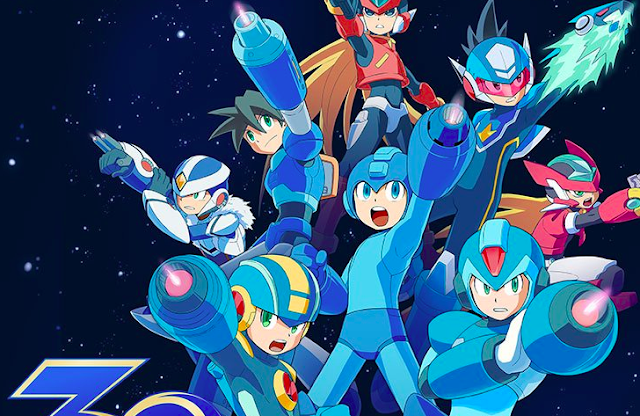 2018 will bring us Mega Man 11, all eight Mega Man X games on current-gen consoles, Mega Man Legacy Collection 1 and 2 on Nintendo Switch, a brand-new animated series and remastered Hitoshi Ariga comics. But wait, there's more! At this very moment, legitimate hope actually exists for new entries in the Mega Man X, Mega Man Legends and the Mega Man Battle Network series. That's something that couldn't be said a year or two ago. 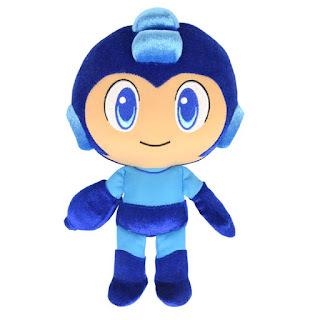 At long last it's an exciting time to be a Mega Man fan. And, oh my god, I finally have actually news to report again. You better believe I'm sticking around. 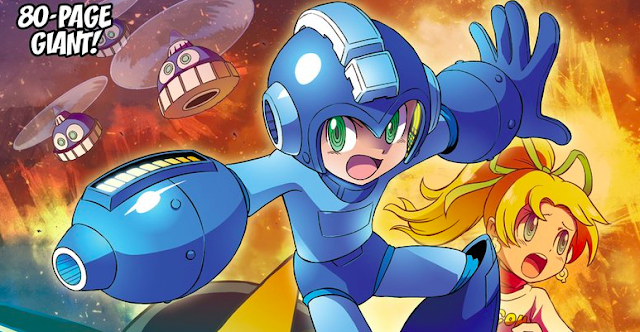 Can We Expect A Mega Man 12? 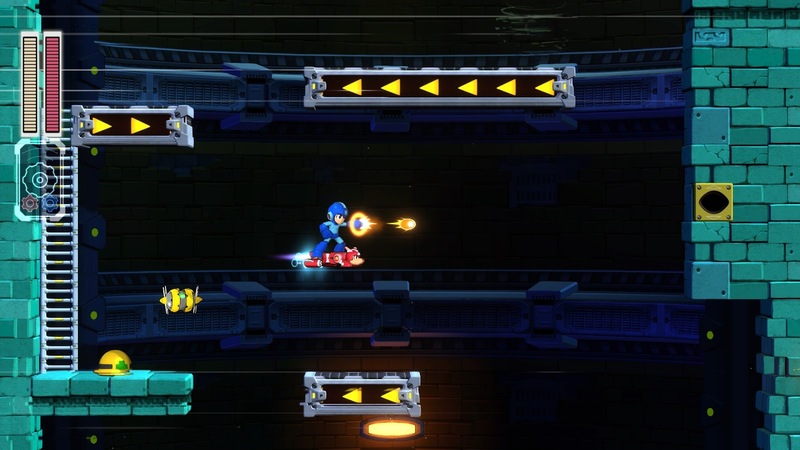 Sequels are usually dependent on the success of the game that came before them, so the fate of a Mega Man 12 will largely depend on the success of Mega Man 11. 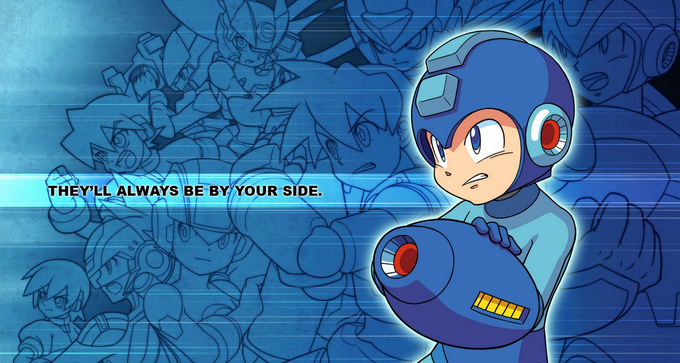 However, Capcom is hoping that Mega Man will come back in a big way. 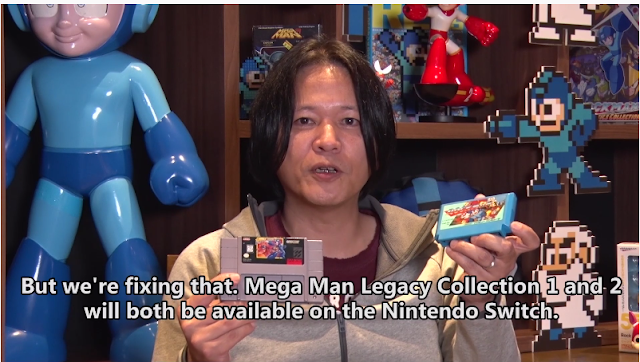 What about The Mega Man X And Legends Series? Obviously, Capcom isn’t ready to announce any new games outside of Mega Man 11, but if this game does well it could lead to a revival across the brand. In fact, we specifically asked members of the team if they were interested in also working on any of Mega Man’s other side franchises. It really sounds like Capcom are going all in on Mega Man 11. They know they have high expectations to meet. At the end of the day, though, money talks. The fans will have to snag Mega Man 11 when it launches in late 2018. The future depends on it! Head to Game Informer for the complete interview. 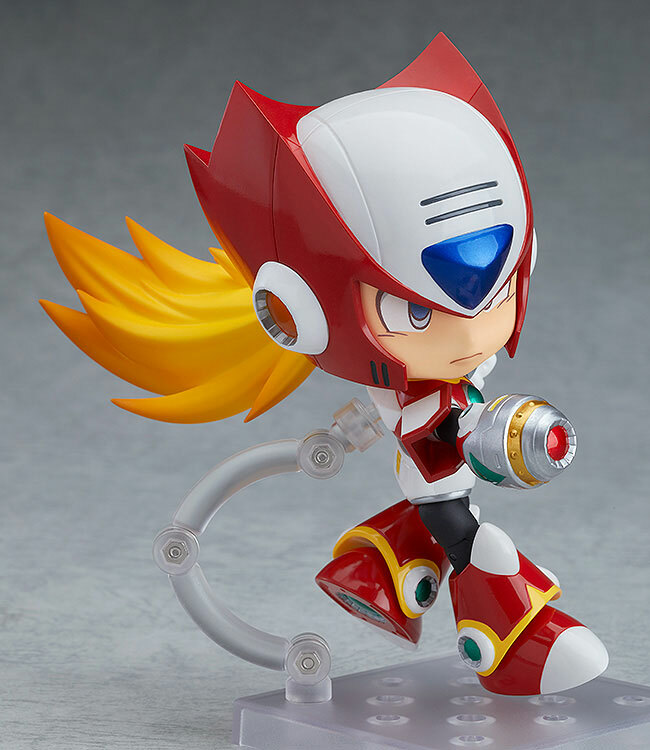 In case you were wondering, nothing is going to stop the proverbial Mega Man "merchandise train" – not even Mega Man 11. 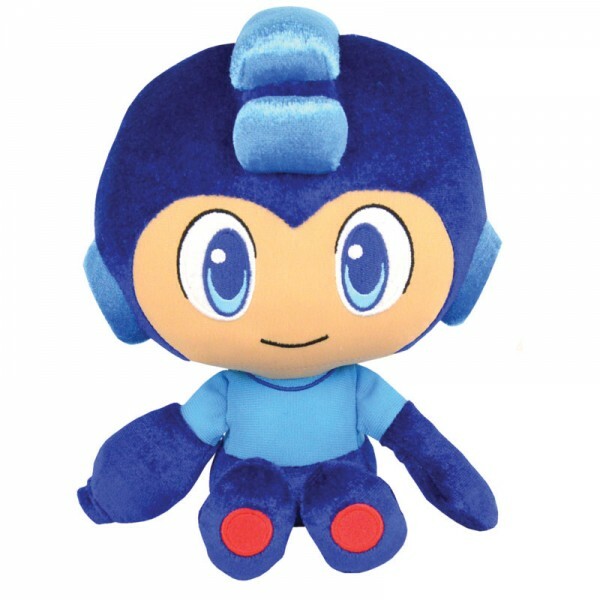 In addition to a number of commemorative 30th anniversary goods, a new line of licensed Mega Man plushies are headed your way in 2018. Though I can only show you Mega Man for the time being, manufacturer Pop Buddies say there are three more characters in the works. Mega Man (and our three mystery friends) will stand at 9.5 inches tall (7.5 when sitting). The full line will be revealed at the International Toy Fair on January 31st. They're working on a cute little Reflector, too. If you're a resident in Europe, you can actually pick up this cuddly guy right now from Omoi. UPDATE: Additional story info, card breakdown added. 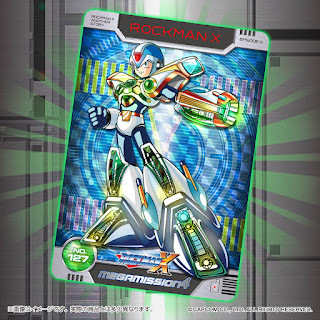 Rockman X & Rockman X Mega Mission Selection Box will be sold exclusively through Premium Bandai. Though some Premium Bandai items are available to ship internationally, that doesn't seem to be an option for this set right now. I'll let you know if anything changes. In the meantime, I'm working on getting an accurate translation of the general plot/character information posted here. 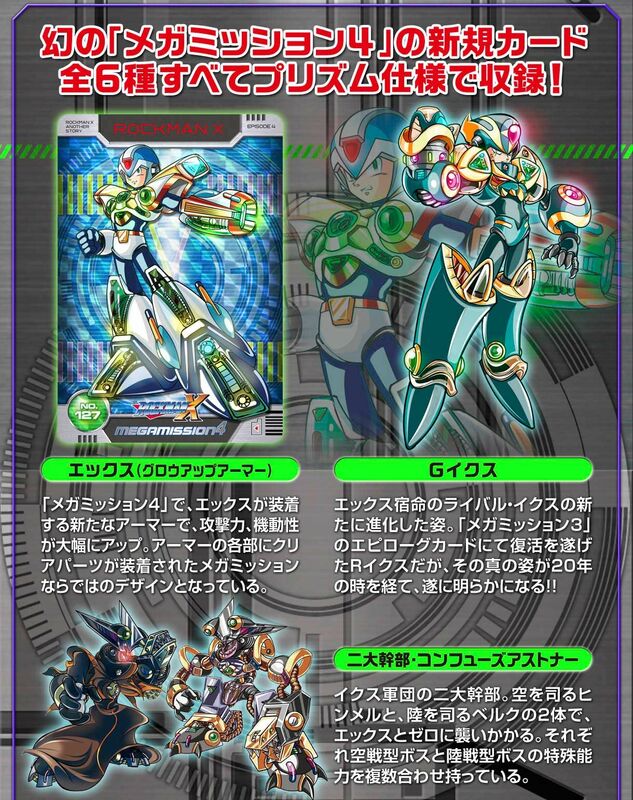 From what I've gathered so far, it appears iX is back alongside a pair of new cronies: Himmel (a Reploid that rules the skies) and Berg (a Reploid that controls the land). 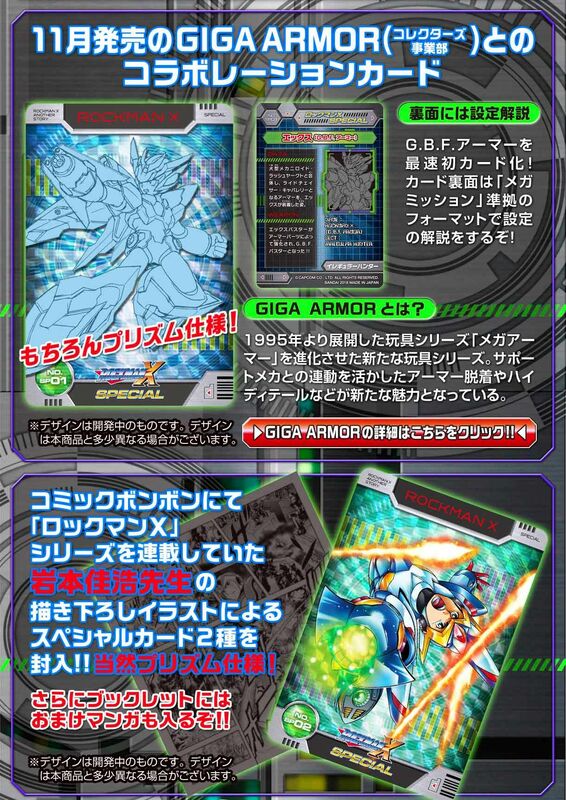 To combat this new threat, X dons a new armor called the "GrowUp" armor. Yes, that's the name they're going with. 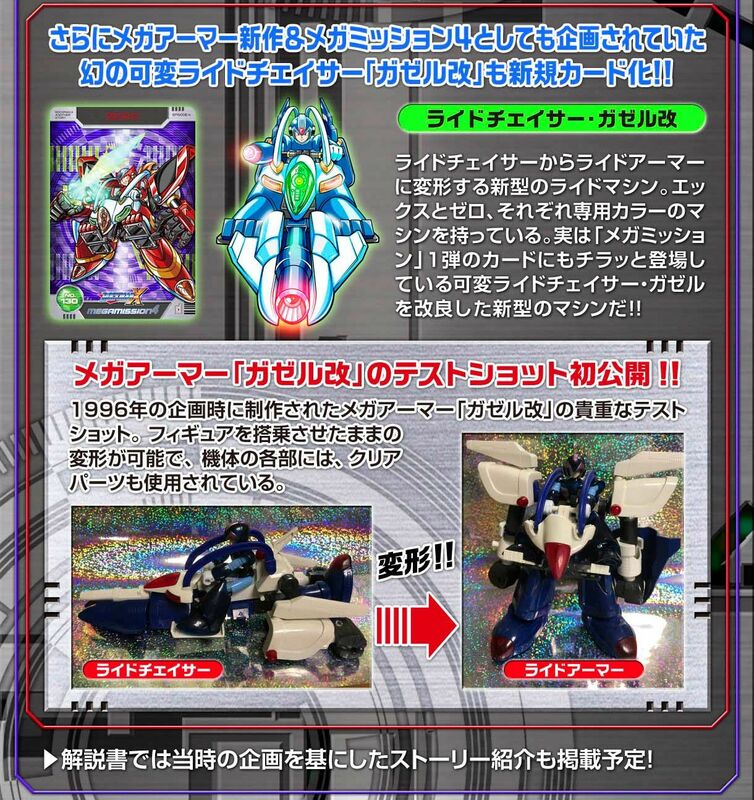 Lastly, X and Zero will be mounting a new Ride Chaser dubbed the "Gazelle". 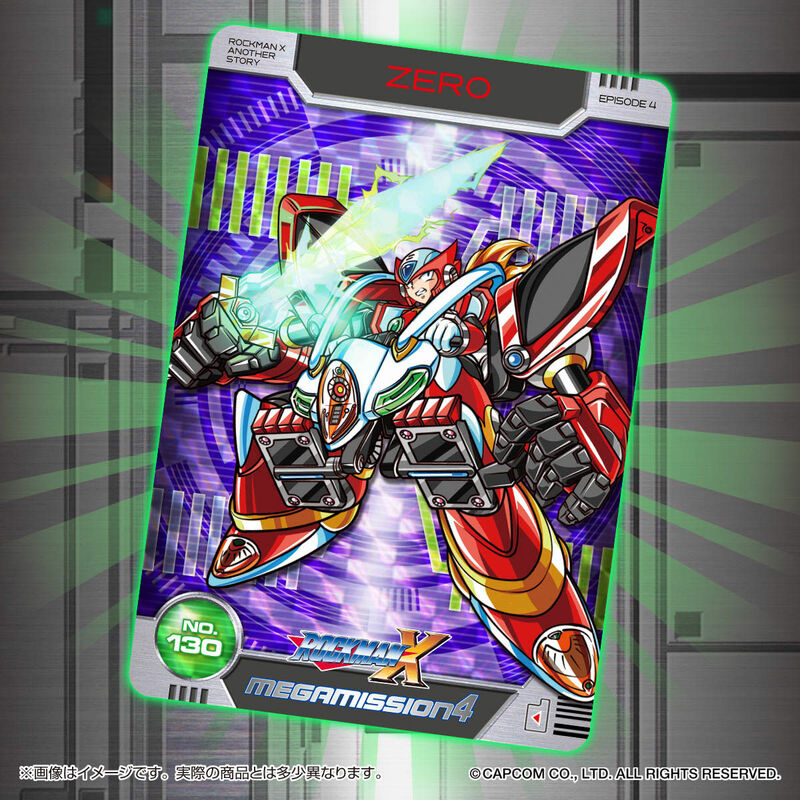 This puppy can transform from a Ride Chaser to a Ride Armor on the fly, significantly boosting X and Zero's strength and mobility. Bandai actually planned to produce the Gazelle as a real accessory in 1996. A prototype of the unreleased Gazelle can be seen in the link above. Unfortunately there are no plans to revive it. A Super Robot Wars collaboration, Mega Mission 4 and more were revealed during last night's Nico Nico Rockman 30th anniversary stream. Pre-orders are live for Good Smile Company's Zero Nendroid from Ami Ami. 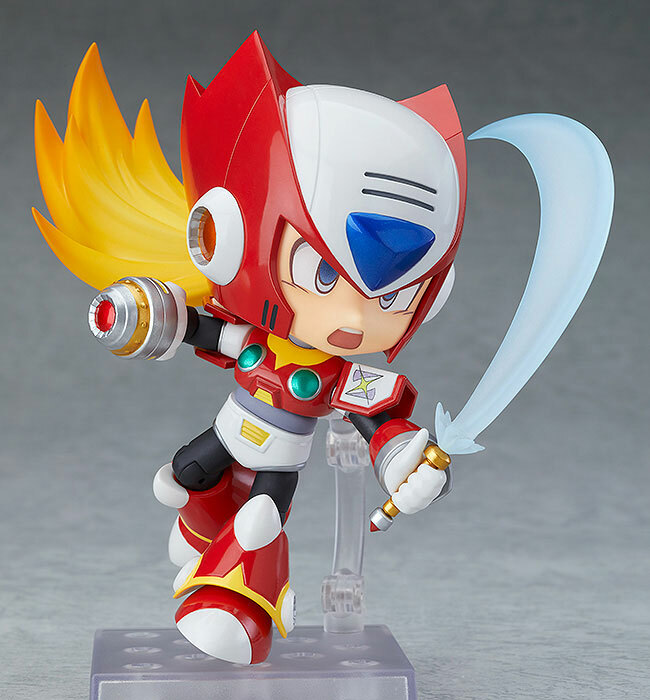 This little Maverick Hunter will set you back 3,980 yen (roughly $34.99). 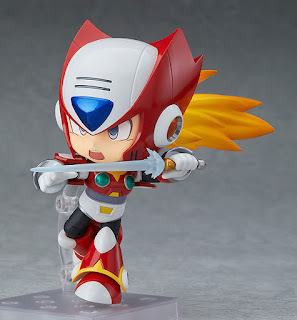 The figure ships with a set of interchangeable faces, Z-Buster and Z-Saber with two different blade parts. A plastic base is included too for all your posing needs. 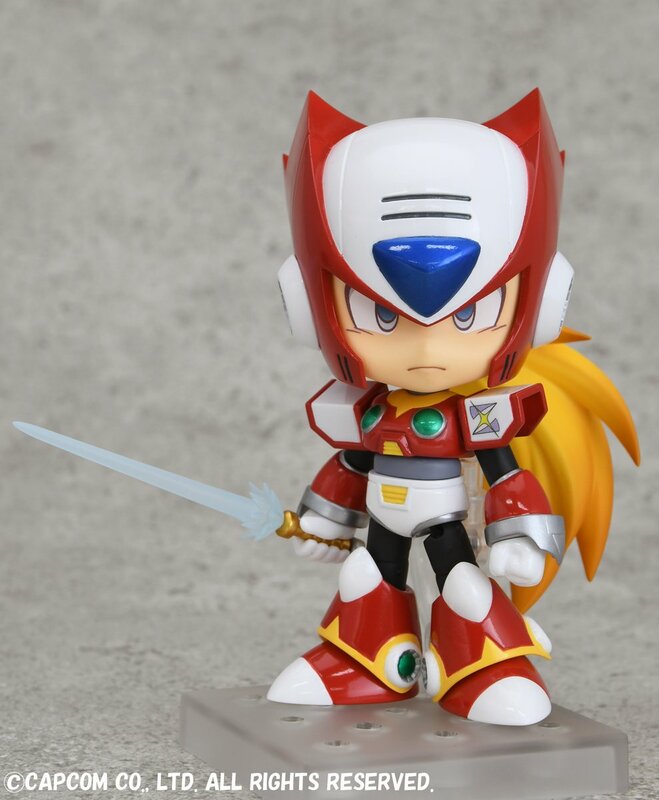 Nendroid Zero is expected to ship in July, 2018. Grab him here! Game Informer's month-long Mega Man 11 coverage continues with a three-minute video segment on the game's art director, Yuji Ishihara. 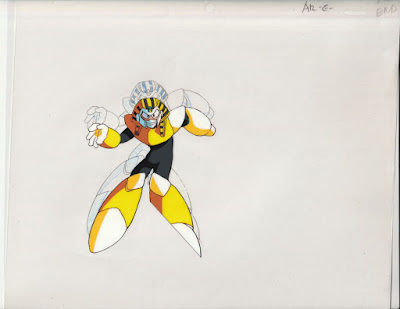 Here, Ishihara talks about what aspects of Mega Man's character he looked at in redesigning the blue bomber for Mega Man 11 and what he hopes to achieve. 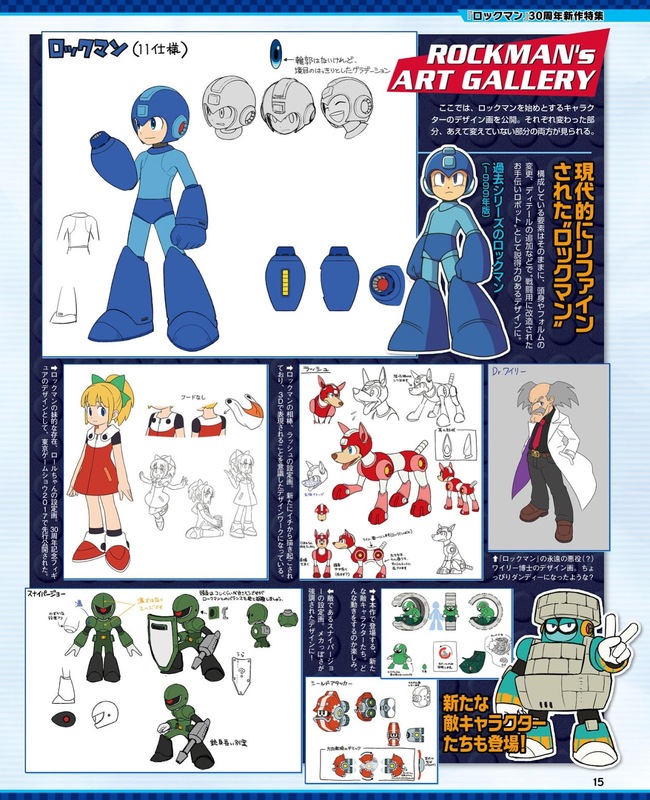 Additionally, we get a nice look at some of Ishihara's past work and some new MM11 concept art. It's definitely worth a watch. Head over to Game Informer for the video! Over the weekend Capcom launched a special trailer for Monster Hunter World titled "Third Fleet." At the tail end of the trailer, it was revealed the game will have a Mega Man collaboration in the form of an 8-bit style Palico and Hunter gear. Skip to 2:45 in the video above to see it in action. After you defeat a Robot Master, you're taken to a blueprint-like screen where you can test out the weapon. It's a bit like a tutorial – you can see what every weapon does before resuming the game. 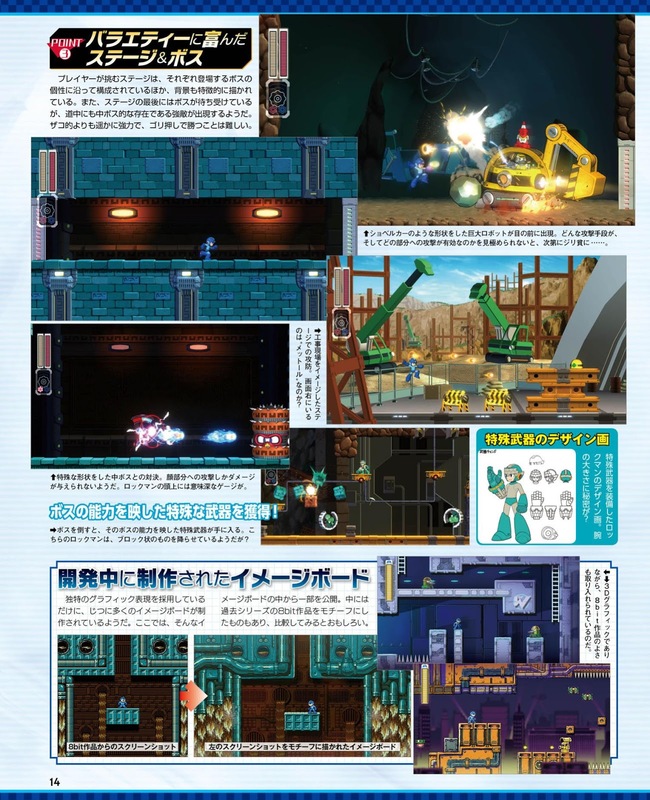 Mega Man 11 has a certain feature/mechanic that changes the gameplay up more than any feature/mechanic throught any mainline Mega Man game. This mechanic is described as "helpful" and completely optional. But when you do use it, it "changes the moment to moment gameplay". That's about all Game Informer could say on the subject. We can infer this mechanic has something to do with the gears beneath Mega Man's health and weapon energy. The composer of Mega Man 11 is an individual that worked on the Star Force series. Game Informer couldn't say who it was, but it could be Akari Kaida, Yoshino Aoki, Marika Suzuki, or Mitsuhiko Takano. Mega Man 11 will receive a physical release. Capcom could not comment on how much the game will cost, though it will be less than the typical $59.99 MSRP. Mega Man Legacy Collection 1 developer Digital Eclipse took to Twitter to field a few questions about the upcoming Nintendo Switch port. In addition to Amiibo support – which will unlock the 11 Amiibo-exclusive challenges – Digital Eclipse confirmed that all the Nintendo 3DS-exclusive Museum Mode images will be making the jump to the Switch version. GameXplain (with a little help from my friend Ash Paulsen) posted a 15-minute in-depth exploration of all the footage and screenshots we have so far on Mega Man 11. It's pretty neat and points out a lot of little tidbits you might have missed. For example, the immediate presence of the Special Weapon gauge from the get-go may suggest Rush's abilities are available by default. In other words, there might never be a need to switch to Rush specifically. All in all, there's some interesting stuff going on here. Kick back, relax and give it a watch! 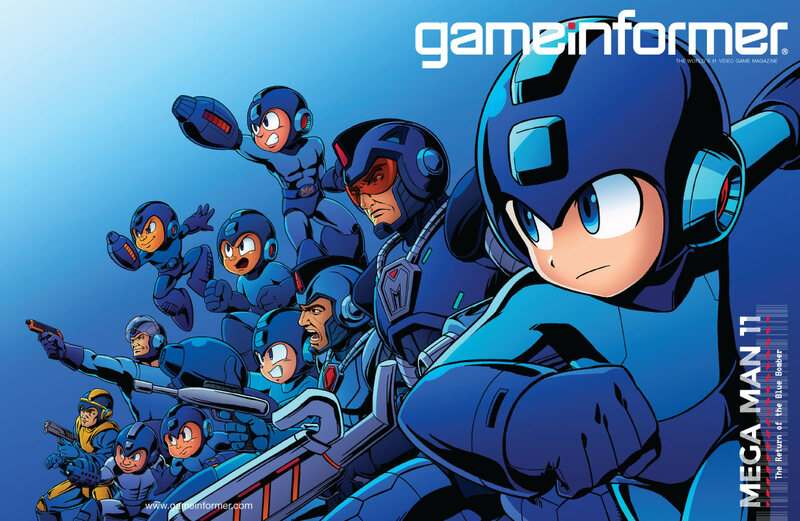 The digital version of Game Informer's Mega Man 11 cover story is now available to read online for subscribers. The story covers a lot of ground and reveals a couple new, interesting details about the game. I am a subscriber and I took some time to jot down some notes you might find interesting. You can read those after the jump. I will not, however, be republishing ANY images from this issue. You'll have to pick it up yourself or wait for screenshots to drop online officially. 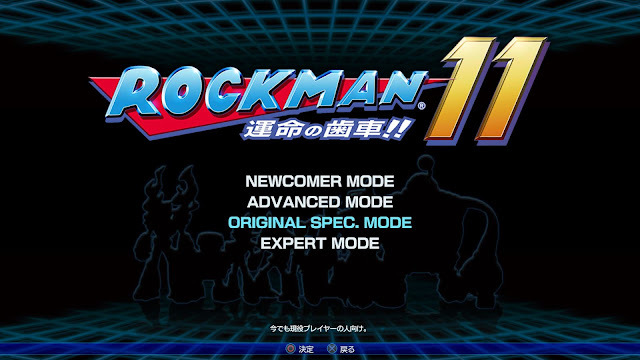 This is the title screen from a demo version of Rockman 11, as seen on the 30th anniversary hub. And would look at that – behind a list of difficulty options, there's some funny looking silhouettes. I'm not a betting man but I'd wager they're MM11's Robot Masters. Surprise! Coming in late 2018 to all current-gen platforms. Just announced on stream, Legacy Collection 1 and 2 are headed to Nintendo Switch in Spring 2018 with Amiibo support. It's unknown at the moment if both games will be sold together or individually. 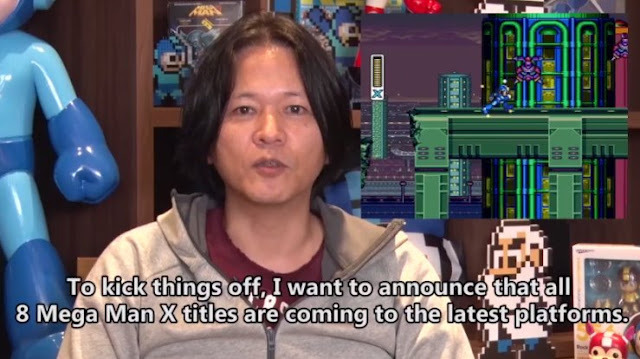 Just announced on the Mega Man 30th anniversary stream, Mega Man producer Kazuhiro Tsuchiya announced that all eight Mega Man X titles are coming to current-gen platforms: PlayStation 4, Xbox One, Nintendo Switch and PC. At this time, it remains to be seen if this will be a collection or individual re-releases. More news as it comes. We're just a couple hours away from Capcom Unity's Mega Man 30th anniversary event. What's gonna happen? What will we see? Tune in and find out! Swallowed up by yesterday's tantalizing 30th anniversary stuff, Good Smile officially revealed Nendoroid Zero at the Tokyo Comic Con. 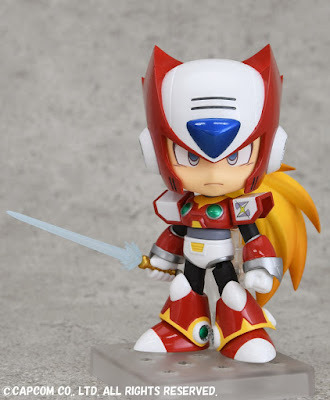 First teased some months ago, "Nendoroid Zero X2 Version" is painted and just about ready for retail. A release date has not been announced, though it shouldn't be too far off.